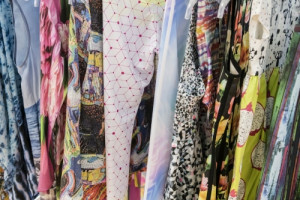 Print Make Wear is the new fast fashion factory experience created within FESPA Global Print Expo 2018. It added a colourful and educational visitor feature to the event, addressing the rising interest in garment production and printing within FESPA’s global community. 467 individual delegates registered specifically for Print Make Wear. They were joined by the 17% of visitors to the wider FESPA event who came with a specific interest in garment decoration and/or manufacturing, and who visited the Print Make Wear area, as well as more than 2,000 visitors who took advantage of the expert-guided feature tours. Technology investment was high on the agenda of visitors to Print Make Wear, with more than half planning to invest within six months, supported by average investment budgets of over Euros 180,000. The audience comprised 90% senior managers, with 76% of visitors having purchasing authority. Many prominent sportswear, clothing and promotional apparel brands were represented among the delegates, with visitors typically occupying business, manufacturing, product development and technical roles. Their feedback shows that Print Make Wear at FESPA 2018 was viewed as an opportunity to update industry knowledge in the areas of increased efficiency and sustainability, workflow and technology and evaluate equipment and technology to inform future investment. Consistent with the FESPA event as a whole, the leading countries in terms of attendance at Print Make Wear were Germany and the UK. Substantial groups also participated from Poland, Spain, Turkey, Italy, Romania, the Russian Federation and Hungary, reflecting the significance of the garment sector in these countries. Print Make Wear is the latest addition to FESPA’s visitor offering around textile printing, which is a focus area for 34% of the 20,442 visitors to FESPA Global Print Expo. The FESPA 2018 Print Census, a worldwide survey of over 1,400 service providers published during FESPA 2018, explores many aspects of textile and garment printing. The survey highlights sports apparel and fast fashion as two major growth applications, and emphasises growing adoption of digital printing technology in response to requirements for faster time to market, small batch production, economical prototyping and customisation. Based on the positive response to the first edition, Print Make Wear will be a feature at regional FESPA events and the FESPA Global Print Expo 2019, which takes place from 14 to 17 May 2019 at Messe Munich, Germany.